Osteoporosis is the most common type of bone disease. Osteoporosis increases the risk of breaking a bone. About one half of all women over the age of 50 will have a fracture of the hip, wrist, or vertebra (bones of the spine) during their lifetime. 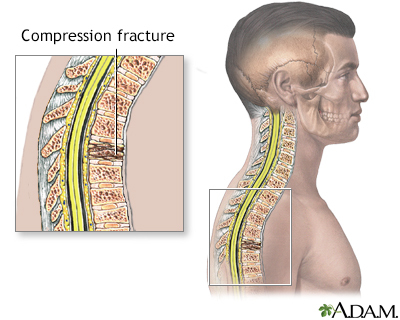 Spine fractures are the most common. During your life, your body continues to both reabsorb old bone and create new bone. Sometimes, bone loss occurs without any known cause. Other times, bone loss and thin bones run in families. In general, white, older women are the most likely to have bone loss. Brittle, fragile bones can be caused by anything that makes your body destroy too much bone, or keeps your body from making enough new bone. As you age, your body may reabsorb calcium and phosphate from your bones instead of keeping these minerals in your bones. This makes your bones weaker. Osteoporosis is a rare disease of the bones. The correct answer is myth. Osteoporosis is the most common type of bone disease. People with osteoporosis develop weak bones that can break easily. Finding and treating osteoporosis early before bones become too weak can help prevent breaks. The correct answer is both. Even though bones are hard, they are living tissue. The body is constantly building new bone tissue to replace the bone tissue it uses up. If it can't do this fast enough, the bones become weak and brittle. Aging, too little calcium, or certain health problems can cause bone loss. The correct answer is none of the above. There are no symptoms in the early stages of osteoporosis. Many times, a bone break is the first sign of the disease. This is why people at risk should be tested for osteoporosis. Ask your doctor about your risk for osteoporosis. The correct answer is all of the above. About half of all women over the age of 50 will have a fracture of the hip, wrist, or vertebra during their lifetime because of bone loss. Menopause is a good time to talk with your doctor about your risk of osteoporosis and how to reduce it. Osteoporosis can make you shorter. The correct answer is fact. Over time, osteoporosis can cause many small breaks along the spine. These breaks in the vertebrae can gradually cause back pain, stooped posture, and a loss of up to 6 inches of height. Your doctor can detect these breaks with an x-ray of the spine. The correct answer is lower spine and hip. Your doctor uses a type of X-ray machine to test you for osteoporosis. You might see small X-ray machines in pharmacies or at health fairs. They can measure bones in the finger, wrist, leg, or heel, but are not as accurate as the X-ray machine your doctor uses. Which lifestyle change can help prevent and treat osteoporosis? The correct answer is all of the above. Your body needs calcium to build bone. To build strong bones, you should get enough calcium in your diet starting in childhood or early adulthood. Dairy products have the most calcium. Smoking and alcohol use reduces bone strength. Talk with your doctor about how to prevent osteoporosis. Osteoporosis medicines can reduce the risk of fractures. The correct answer is fact. Bisphosphonates (Fosamax, Boniva, Actonel , or Reclast) are used to prevent and treat bone loss. They help make the bones in your hips, spine, and other areas stronger. You may take a pill weekly or monthly or have an IV infusion once a year. Talk with your doctor about the pros and cons of this medicine. Your doctor will prescribe medicine only if you already have osteoporosis. The correct answer is false. Your doctor may also prescribe medicine if you have had a bone fracture and a bone test shows your bones are thinner than normal bones. The goal is to prevent another bone fracture by building up your bones. B. Have vision exams once or twice a year. C. Leave lights on at night. E. Avoid medicines that make you sleepy. The correct answer is all of the above. Hip fractures are one of the main reasons people have to go into nursing homes. If you have osteoporosis, and even if you don’t, avoiding falls and fractures can help you stay independent. Talk with your doctor about other ways to prevent falls. There are no symptoms in the early stages of osteoporosis. Many times, people will have a fracture before learning they have the disease. Fractures of the bones of the spine can cause pain almost anywhere in the spine. These are called compression fractures. They often occur without an injury. The pain occurs suddenly or slowly over time. There can be a loss of height (as much as 6 inches or 15 centimeters) over time. A stooped posture or a condition called a dowager's hump may develop. 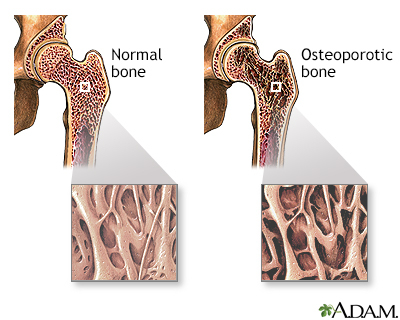 Diagnose bone loss and osteoporosis. Predict your risk for future bone fractures. A simple spine or hip x-ray may show fracture or collapse of the spinal bones. However, simple x-rays of other bones are not very accurate in predicting whether you are likely to have osteoporosis. A new low-radiation spine x-ray called a vertebral fracture assessment (VFA) is now often done with a DEXA to better identify fractures that do not have any symptoms. You may need blood and urine tests if your provider thinks the cause of your osteoporosis is a medical condition, rather than the slow bone loss that occurs with aging. DEXA scan results compare your bone mineral density with both a young adult who has no bone loss and with people your age and gender. This means that at age 80, almost one third of women with normal age-related bone loss would have osteoporosis, based on their DEXA scan results. Osteoporosis has been diagnosed by a bone density study, whether or not you have a fracture and your fracture risk is high. You have had a bone fracture and a bone density test shows that you have thin bones, but not osteoporosis. Avoid any exercise that presents a risk of falling. Also, do not do high-impact exercises that can cause fractures in older adults. Adults under age 50 should have 1,000 mg of calcium and 400 to 800 International Units (IU) of vitamin D a day. Women ages 51 to 70 should have 1,200 mg of calcium and 400 to 800 IU of vitamin D a day. 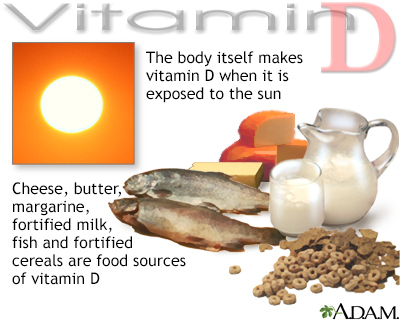 Men ages 51 to 70 should have 1,000 mg of calcium and 400 to 800 IU of vitamin D a day. Adults over age 70 should have 1,200 mg of calcium and 800 IU of vitamin D a day. Your provider may recommend a calcium supplement. Follow a diet that provides the proper amount of calcium and vitamin D.
Your provider may recommend higher doses of vitamin D if you have risk factors for osteoporosis or a low level of this vitamin. Limit your alcohol intake. Too much alcohol can damage your bones. This puts you at risk of falling and breaking a bone. Do not take medicines that make you drowsy and unsteady. If you must take them, be extra careful when you are up and about. For example, hold on to countertops or sturdy furniture to avoid falling. Remove household hazards, such as throw rugs, to reduce the risk of falls. Leave lights on at night so you can see better when walking around your house. Install and use safety grab bars in the bathroom. Install antislip flooring in bathtubs and showers. Make sure your vision is good. Have your eyes checked once or twice a year by an eye doctor. Wear shoes that fit well and have low heels. This includes slippers. Slippers that do not have heels can cause you to trip and fall. Do not walk outdoors alone on icy days. Medicines to treat osteoporosis can help prevent future fractures. Spine bones that have already collapsed can't be made stronger. 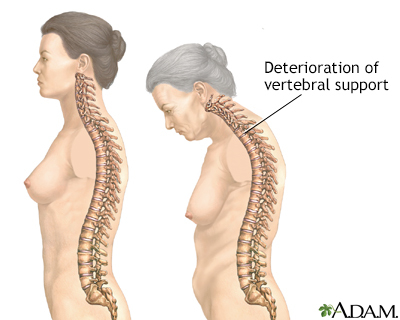 Osteoporosis can cause a person to become disabled from weakened bones. Hip fractures are one of the main reasons people are admitted to nursing homes. Be sure you get enough calcium and vitamin D to build and maintain healthy bone. Following a healthy, well-balanced diet can help you get these and other important nutrients. Do not drink large amounts of alcohol. Medicines can treat osteoporosis and prevent fractures. Your provider can tell you if any are right for you. If you are 67 years of age or older, and have recently experienced a bone fracture, please contact your doctor about screening for osteoporosis. Adler RA, El-Hajj Fuleihan G, Bauer DC, et al. Managing osteoporosis in patients on long-term bisphosphonate treatment: report of a Task Force of the American Society for Bone and Mineral Research. J Bone Miner Res. 2016;31(10):1910. PMID: 27759931 www.ncbi.nlm.nih.gov/pubmed/27759931. Black DM, Rosen CJ. Clinical practice: postmenopausal osteoporosis. N Engl J Med. 2016;374(3):254-262. PMID: 26789873 www.ncbi.nlm.nih.gov/pubmed/26789873. Cosman F, de Beur SJ, LeBoff MS, et al; National Osteoporosis Foundation. Clinician's guide to prevention and treatment of osteoporosis. Osteoporos Int. 2014;25(10):2359-2381. PMID: 25182228 www.ncbi.nlm.nih.gov/pubmed/25182228. Kemmler W, Bebenek M, Kohl M, von Stengel S. Exercise and fractures in postmenopausal women. Final results of the controlled Erlangen Fitness and Osteoporosis Prevention Study (EFOPS). Osteoporos Int. 2015;26(10):2491-2499. PMID: 25963237 www.ncbi.nlm.nih.gov/pubmed/25963237. North American Menopause Society. Management of osteoporosis in postmenopausal women: 2010 position statement of The North American Menopause Society. Menopause. 2010;17(1):25-54. PMID: 20061894 www.ncbi.nlm.nih.gov/pubmed/20061894. In a compression fracture the body of the bone tissue of the vertebra collapses. This can occur because of trauma or a disease process such as osteoporosis or a tumor. 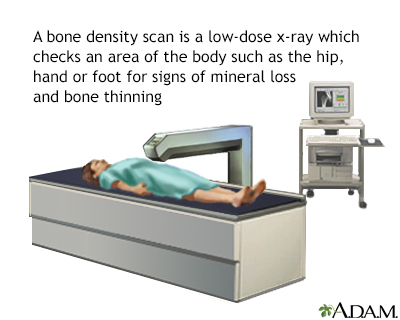 A bone density scan measures the density of bone in a person. The lower the density of a bone the higher the risk of fractures. A bone scan, along with a patient's medical history, is a useful aid in evaluating the probability of a fracture and whether any preventative treatment is needed. A bone density scan has the advantage of being painless and exposing the patient to only a small amount of radiation. 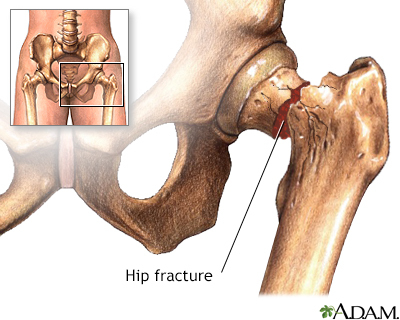 Hip fractures occur as a result of major or minor trauma. In elderly patients with bones weakened by osteoporosis, relatively little trauma, even walking, may result in a hip fracture. Like most vitamins, vitamin D may be obtained in the recommended amount with a well-balanced diet, including some enriched or fortified foods. In addition, the body manufactures vitamin D when exposed to sunshine, and it is recommended people get 10 to 15 minutes of sunshine 3 times a week. 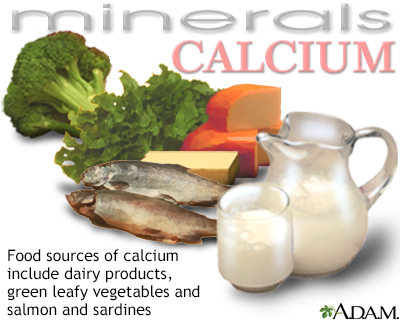 Calcium requires adequate vitamin D in order to be absorbed by the body. In the United States, many food sources of calcium such as milk are fortified with vitamin D.
Getting enough calcium to keep bones from thinning throughout a person's life may be made more difficult if that person has lactose intolerance or another reason, such as a tendency toward kidney stones, for avoiding calcium-rich food sources. 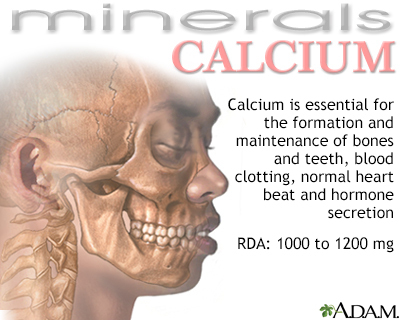 Calcium deficiency also effects the heart and circulatory system, as well as the secretion of essential hormones. There are many ways to supplement calcium, including a growing number of fortified foods. Exercise plays an important role in the retention of bone density in the aging person. 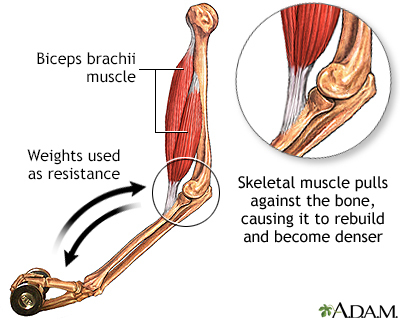 Studies show that exercises requiring muscles to pull on bones cause the bones to retain and possibly gain density. 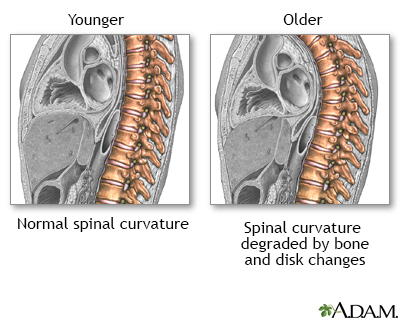 The spine weakens with age, becoming more curved and more fragile. Reviewed By: Gordon A. Starkebaum, MD, Professor of Medicine, Division of Rheumatology, University of Washington School of Medicine, Seattle, WA. Internal review and update on 01/19/2019 by David Zieve, MD, MHA, Medical Director, Brenda Conaway, Editorial Director, and the A.D.A.M. Editorial team.